The Matrix is going to give the player a theme that is based on the 1999 film which had this name. There were two other movies, making this a trilogy overall, but it’s the first film that has gotten most of the attention. The action takes place in the matrix here, so you will see the green code over a black background in the image placed behind the reels. Once we move to the actual symbols that the reels are hosting, you will find there images of some of the major actors that were in the movie, along with things like sunglasses, rotary phones or different logo like symbols which appear to be taken from the code of the matrix. Agent Smith, Neo, Trinity and Morpheus are among the symbols which show major characters from the film. The graphics look good, appropriate for the film theme in any case, so if you’re a fan you should find it enjoyable. Playtech has one of the larger slot machine collections among the online developers. 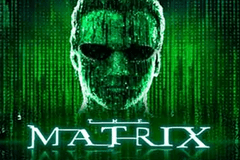 They probably offer the largest number of branded slot machines as well, and The Matrix is just the latest example. Comic book themed slot machines are a specialty of theirs, but they’ve covered movies, TV series, animation series and video games before. I generally enjoy the graphics and features in the slots they put out, and progressive jackpots are available in a lot of titles, especially the Marvel Universe ones. The players that are wagering on The Matrix will cover 50 lines, using 50 coins for that purpose. You can basically decide the coin value, or the line bet if you will. The range for it will be as low as $0.01, or as high as $2. You will get an overall betting range of $0.50 to $100. The game will use stacked symbols on many occasions, especially when you’re getting Agent Smith, Morpheus or Trinity to show up. The rest of the symbols are regular sized. They’re all forming regular combinations. There is an extensive list of features in The Matrix, and appropriately enough it all starts with the Neo icon, the wild symbol that you can get to form combinations which offer rewards of up to 500x. Often enough though, it will be used only as a substitute. There is a second wild symbol present in the game, the one showing a Black Cat. This is a symbol that you can also use as a wild, and which is only pop up on reel 5. Get it to appear, and a glitch in the Matrix will occur, just like it happened in the movie. The Black Cat wilds will cover the 5th reel and then will duplicate on all positions on reel 1. The Déjà Vu Shuffle feature will keep those two reels locked with 8 wilds on them, while the other symbols will shuffle around to form new wins. The game has scatter symbols as well, marked Free Games and showing the red and the blue pills. Three reels can get them, and together they can trigger a free games choice, that will give you free spins based on Agent Smith or on Nebuchadnezzar. A big reward in The Matrix will arrive via five wild Neo symbols, forming a combo which will pay 500 coins, or up to $1,000. The Matrix should be a highly enjoyable slot machine for most players, though perhaps it arrives a bit late, since there have been 18 years already since the original movie came out.